We’ve always called Mina a greyhound but technically she’s a lurcher. She looks about 99.9% greyhound but if you look really closely, you can see that her head shape and her stomach aren’t quite ‘full greyhound’. Mina never raced and isn’t tattooed in her ears and she certainly responds differently to training than Stevie and Jasper (although this may be more to do with nurture, rather than nature – something I’d like to explore a bit more in the future). 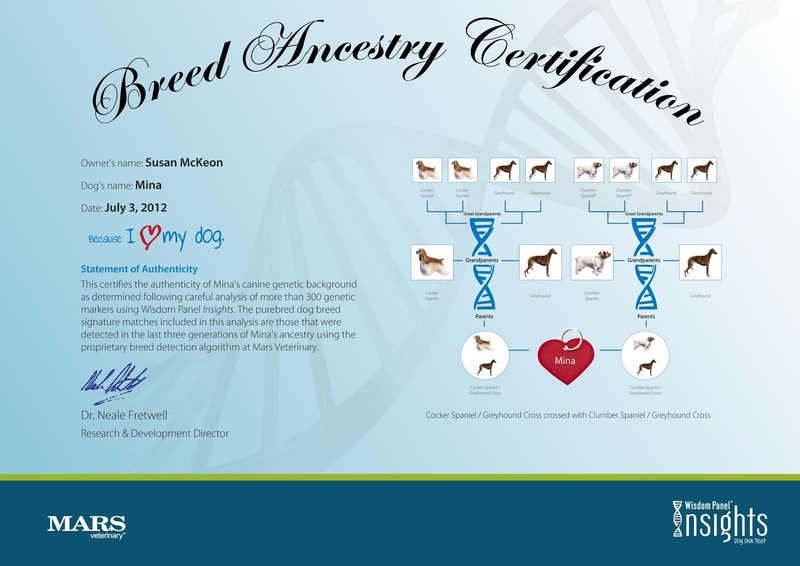 In my training classes, I often ask clients to find out what their dog was originally bred for. It’s not just that I like setting homework (honest!) but once you are armed with the knowledge of what your dog was bred for, you can use it to your advantage in training. 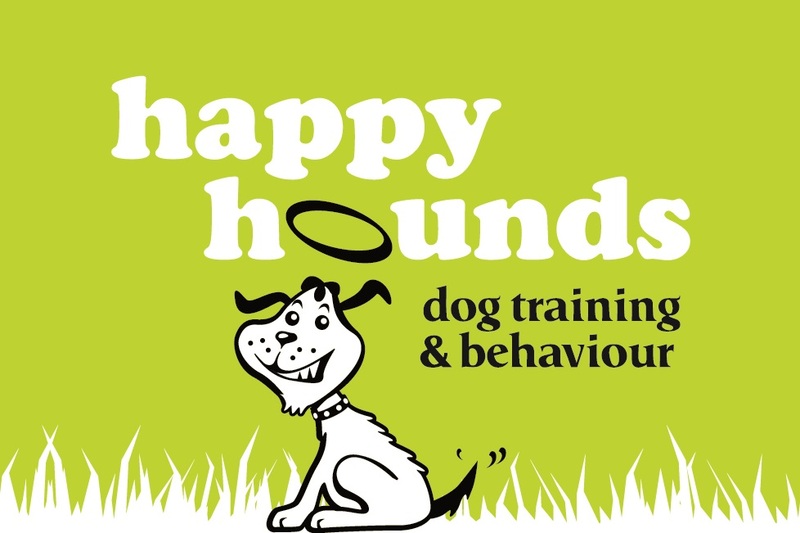 For example: a Border Collie is bred to be a working dog, herding sheep and to be busy., knowing this you can channel your Collie’s instincts into training and games that fulfil this need; likewise with retrieving breeds or using nosework to motivate the scent hounds. So, I was intrigued to see if there was anything in Mina’s DNA that would explain some of her behaviour. After a bit of searching I plumped for the Wisdom Panel DNA test, which is easily available in the UK. I only ever meant it to be a bit of fun, after all the DNA results state that they use - and what sounds to me, like a very complicated - computer algorithm to predict the most likely combination of pure and mixed breed dogs in the last 3 ancestral generations that best fit Mina’s DNA marker pattern. The process of taking a swab of Mina’s DNA was really simple. The test is easy to purchase via Amazon and costs around £59.99. Everything arrived very quickly in pre-sealed, sterilised envelopes with easy to follow instructions. The swabs themselves looked a bit like very small bottle cleaners (with bristles at the end) and all I needed to do was not touch the bristles and make sure that I took 2 separate swabs from inside Mina’s cheek/gums. 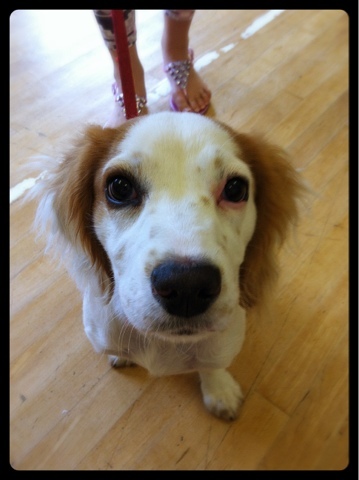 Betsy - the Cocker Spaniel. Any similarities to Mina? So, swabs taken and returned to Wisdom Panel, all I had to do was wait. Handily, there is an online results tracker which shows when the swab has been received and how it’s progressing through the labs. In 3 weeks the results were through…. 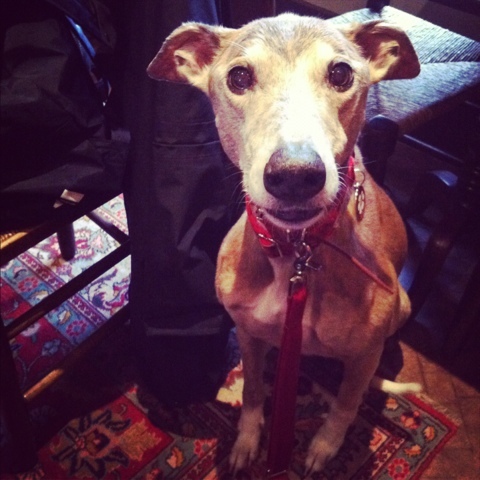 I thought Mina may have some terrier genes and I took the greyhound genes as read…. but the results revealed something I wasn’t prepared for at all! So what did they say, I hear you ask? 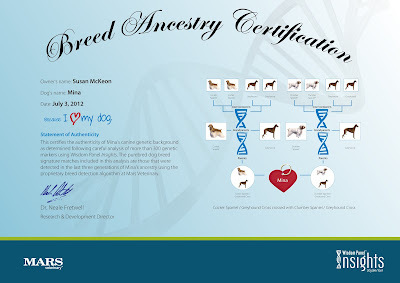 Well, according the DNA markers Mina has Greyhound (no surprises there), Cocker Spaniel and Clumber Spaniel DNA! I’m still somewhat dumbstruck by this, especially as the Clumber Spaniel is such a rare breed. I’m not sure if I can really see any Spaniel traits in Mina – although for a sight hound she is incredibly sniffy on walks and does seem to spend a lot of time sniffing the ground. It will be interesting to see how she gets on at the Sirius Sniffers Seminar this September, with Kelly Gorman Dunbar, as the seminar is dedicated to nosework. So, what does Mina make of it all? Not a lot, I suspect. She’s still the lovable, demanding, pretty greyhound/lurcher I fell in love with all those years ago and greyhound/spaniel or not, I love her just the same. At least they got greyhound right. That makes there other conclusions more believable. We have DNA tested 3 different mixed breeds belonging to my parents and sister and they came back with some crazy guesses, but none of the dogs is obviously a mix of this or that. The are all mixes of mixes, I think.